It seems a bit pointless to me too. Maybe they wanted to stymie anyfin can happen decks. So they’ve now deployed the deck slots and the new deck recipes feature! I did a quick scan of all the recipes and they mostly look pretty reasonable. The priest “strike from the shadows” one with mind blast I maybe wouldn’t recommend, but overall they seem like a great way to introduce new players to some of the common archetypes. Handlock, dragon priest, tempo mage and zoo are all in there, as well as a “classic X” deck for each class that is still a bit more developed than the basic decks you get at the very beginning. I’m going to feel pretty comfortable directing my friends to this feature when they’re getting into the game. I’m going to try out their beast druid and dragon paladin decks actually. Both are archetypes I’ve dabbled with myself in the past but found to be lacking in the current metagame, but they are still fun. And 18 deck slots are obviously nice. My fav new feature is the advanced searching. attack and health also have ranges, for example: attack:6- shows anything that can dodge Big Game Hunter,attack:7+ shows anything that can’t. owned:3+ to see all cards you own 3 or more of. Or owned:3 to see exactly 3 owned. owned:0 is the same asmissing. **extra **finds all cards that you have extras of. That is, 3+ for non-Legendaries, and 2+ for Legendaries. **mana:4 **to see all 4-mana cards. mana:8-9 to see all 8-9 mana cards. Sigh. My phone didn’t auto-update the Hearthstone app because it’s close to a gig in size. Now to wait an hour or two while it downloads. I wonder if they fixed what I would consider a bug - Having cards show up as new even though you’ve already got 2 copies of them. I only play on mobile, so maybe it’s specific to that, but it’s annoying. I open a few packs, don’t pay all that much attention to the rares and commons, but then I go check my collection for new stuff and it’s listing every card I just opened as new all over again. 18 deck slots is certainly a lot better than only 9, but I really think they should let you have as many deck slots as you want. I don’t see what benefit they might possibly gain from limiting deck slots in any way. But I’ll take what I can get. Now I can have multiple decks for the classes I use frequently without having to worry about deleting one to make room for just a single deck for classes I don’t use often. And I like the new search terms. I wonder if they fixed what I would consider a bug - Having cards show up as new even though you’ve already got 2 copies of them. I only play on mobile, so maybe it’s specific to that, but it’s annoying. I open a few packs, don’t pay all that much attention to the rares and commons, but then I go check my collection for new stuff and it’s listing every card I just opened as new all over again. This happens to me all the time, since I’ve got most of the basic cards. It’s not mobile-specific. I agree it would be nice if they fixed it. EDIT: It seems to have been partially fixed. The faux-new cards are no longer highlighted in the collection, but the little number on the tab icon is still there, and disappears once you’ve visited the page with the card in question. Silly. The game has a lot of cards and it’s very difficult to test every combination. Some stuff will be unbalanced, it happens. However, Anyfin Can Happen is one of the narrowest-use cards in the game (read: THE WORST arena draft card ever). It really only works in a hyper-specific deck type, which means it SHOULD have been very easy to playtest - and that playtesting would have had to include Murk-Eye because why on earth wouldn’t you? So basically it seems unlikely that they ‘didn’t know’ that was a good combo - it’s obviously a good combo, it’s not complicated or unexpected! Edit: also, on top of that, Anyfin Can Happen will one day be retired and that would no longer be an issue even if it was now, whereas Old Murk-Eye is gonna be perma-retired for all time, right? No, the promotional cards will still be legal in Wild, as far as I understood it. Sorry, I meant perma-retired as in “will not be returned to Standard at a point in the future when Anyfin Can Happen doesn’t exist,” e.g. it doesn’t make sense to make that long-term decision on the basis of a short-term card combo. It may be that they just are really nervous about powerful charge minions in general and the way that constricts they’re design. I guess we’ll find out: if they nerf Leroy Jenkins, that’s probably the case, if they don’t then who knows. But it would be nice if they said that rather than using an arbitrary “reward cards” rule. Yeah I don’t really know their rationale. Also, Leeroy was already nerfed once and was almost completely dropped from competitive decks. He’s made a bit of a comeback lately but is nowhere near as prevalent as he used to be and I don’t see why they should nerf him again. But it’s true that they’ve had a troubled relationship with the charge mechanic overall. I think it turned out much more powerful than they anticipated originally. In mtg, blocker’s advantage made charge powerful, but not THAT powerful. In HS we’ve had controversies with the warrior charge combo, Leeroy Jenkins, druid combo, warsong commander. Murk-Eye was never one of the problematic ones though. I read over at IGN that one of the designers simply said it was a matter of not wanting to amend card lists, in other words it was laziness. They didn’t want to go back and edit the cards to make the promo cards into Classic cards. They considered it easier to just let the promo cards remain solely on the “promo” list, and since anything not on the Classic, Basic, and (insert most recent set names) lists is considered non-Standard, it meant that the promo list falls into Wild entirely. Which should, ostensibly, mean that any new promo cards that come out in the future will be considered Wild-only as well. Unless Blizzard decides to backtrack on their laziness. Mike Donais: That’s definitely an option that we would consider, but it’s not really the goal of those promo cards. The promo cards, we found, were adding some complexity to the game because they had their own set listed and people wondering how to get them, and I don’t think they added that much fun to the game for the complexity that they added, especially once we – in the Hearthstone collection, we had to add, like “here’s Standard, here’s Wild” plus “here’s the promo cards”, “oh and here’s some more cards” the list there got really complex and long and adding more complexity to that once we have Standard and Wild was not a thing we want to do, so I don’t see this as a very likely option for us to pursue. Just looked at some of the new cards that have been revealed over the last week or so, and I have to say I like the idea of the Giant Sandworm. 8/8 for 8 that can attack again if it kills a minion with its previous attack. Seems like it would be a fairly strong late-game board clear if you were able to give it charge. Considering that it’s a hunter card, it probably won’t see much play though since aggro is about all they seem to do and by turn 8 their game is pretty well over one way or another. Eater of Secrets is going to be a bit of a game changer too. Battlecry of destroy all enemy secrets and gain +1/+1 for each. Along with Avenge cycling out, you’ve got what looks to be a decent hobble for secret pally. It’s going to hurt some mage and hunter builds as well, but not as badly. I might be wrong, but I actually don’t think eater will be a big deal. Secret paladin will take a hit in general with the loss of muster and minibot and avenge, and will probably not be strong enough to motivate the inclusion of a card that is completely worthless in most matchups. Interesting about the promo cards. That seems like a silly reason, but I understand their wish to keep things streamlined when they’re building the infrastructure for coming years. One interesting opportunity that was mentioned on The Angry Chicken is that since these cards will be wild-only, they are a possible channel for injecting special cards directly into wild, bypassing Standard completely. So if some situation arises in the future where wild goes completely bananas and is in need of a counter card for something specific, they have the option to do that without affecting standard. Not sure it will be needed, but it’s a small upside at least. First game of the new brawl. That was fun. 20 damage per turn, checks out. KT’s Hero Power either dominates the game with a single good early game drop, like the +atk per card in hand lady or backfires hard, like it did in one game for my opponent who repeatedly drew spiderlings from Haunted Creepers. Overall, I’ve seen KT perform way better than Archi. Might be small sample bias though, it’s really nice if you draw early removal into midgame staff pieces into sensible Legendaries (you hear me, Lorewalker Cho?). Keeper of Uldaman is a great tool for misleading your opponent with Cho or the self-damage ghost dude btw. Yeah I think KT is somewhat favoured, but not as blatantly as with earlier boss fight brawls. Importantly, Rafaam’s hero power gets really awesome lategame, while KT’s can get pretty sucky as you said. It’s probably often worth it to not even play the creepers, and scientist is a border case as well. 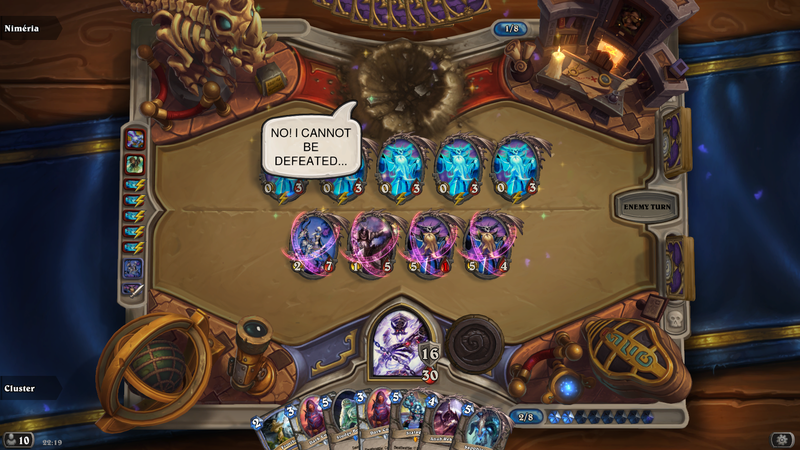 In that game I screenshotted I held off on playing other minions for a long time in order to guarantee the spectrals. My KT plan is mulligan hard for a good turn 4/5 drop and don’t play anything before that, bonus points if you get heigan out on turn 3. The only way you lose from that is if it gets turned into a pit snake. I’ve even started not bothering to drop cultist or gluth as they turn your hero power from single handedly game winning to meh. Wow, that’s incredibly disappointing, and yes, weirdly lazy. We’re literally talking about two whole cards here. Just make them Classic. Yeesh. Also I just played a Rafaam game where I got level 3 staff on turn 3 (which I didn’t even think was possible). I won that game. With this current brawl, I’ve won exactly one game with Rafaam, out of 10 or more played. My KT ratio is more like a 2:1 though. Getting a Heigan or Gothik early and not playing any other minions until well into the late game is pretty much a guaranteed win. The only time I was ever totally trounced as KT was when my opponent got his staff completed on turn 3, got a Confessor Paletress out on turn 4, and on turn 5 Paletress pulled out a Deathwing. Pretty much every turn after that saw 2 legendaries hitting the board, and there was just no recovery from it. I would say I’ve won about 40% of my Rafaam games (and I am not a top-tier player) so I think while KT is both easier to play and has a slight advantage, it’s balanced enough for my taste. “If you’re excited about our upcoming Standard format, we have you covered—all of our Deck Recipes are Standard-friendly.” So they’re saying those decks will be playable in Standard when it launches! Which means those cards must initially be legal in standard, riiiiight?